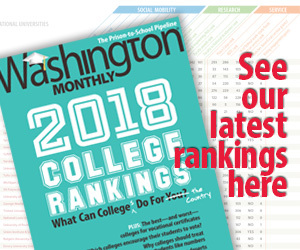 Washington Monthly | Why Is the Country So Deeply Divide Over Obamacare Implementation? Why Is the Country So Deeply Divide Over Obamacare Implementation? The US has split over whether to implement the Medicaid expansion in the Affordable Care Act. 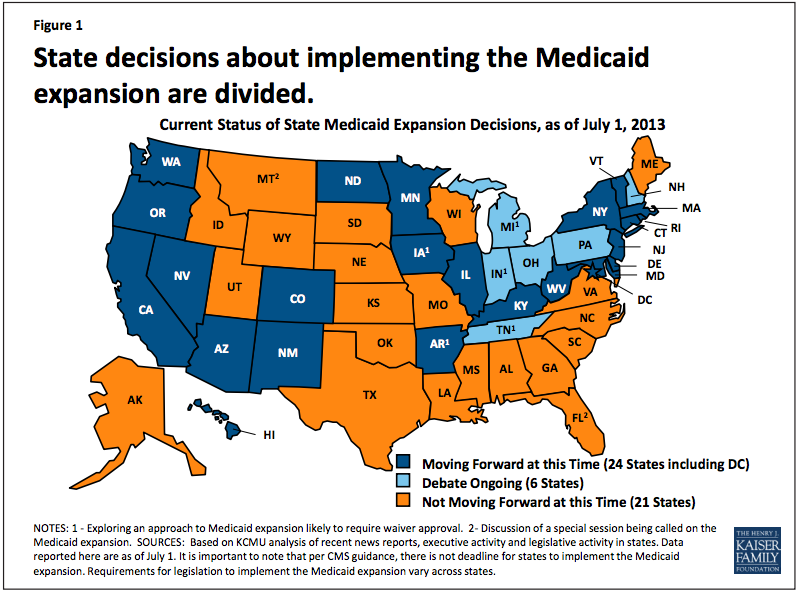 The dark blue states are expanding Medicaid. Let’s imagine they were a country — call it Liberalia. Liberalia had an estimated 146 million people in 2012. The remaining states have either rejected the expansion or are still debating it. Call them Teapartystan, a nation of 168 million people. Liberalians live longer than Teapartystanis. Life expectancy of birth summarizes manifold health differences across regions. The average life expectancy in Liberalia is 79.9 years, which is the life expectancy of Great Britain and Belgium. Compare this to 78.1 years in Teapartystan, the life expectancy of Cuba, the Czech Republic, and Barbados. Does this 1.8 year difference seem small? Sum this difference across all Teapartystanis and you get about 300 million life-years lost. The eight states with the highest life expectancy are Liberalian: New Jersey, Massachusetts, New York, Vermont, California, Connecticut, Minnesota, and Hawaii (which would be on the map if my programming skills were better…). Four of the states with the lowest life expectancy are Teapartystani: Mississippi, Alabama, Louisiana, and Oklahoma (the fifth, West Virginia, is Liberalian). Life expectancy ranges widely across the states. Minnesota and Hawaii have the life expectancy of Norway or the Netherlands. 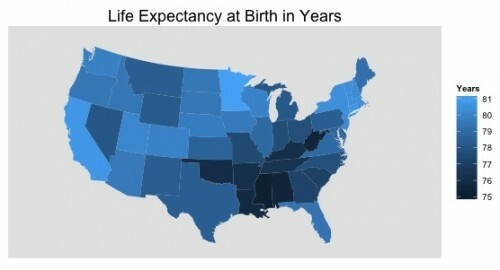 Mississippi and Alabama have the life expectancy of Mexico, Vietnam, or Venezuela. 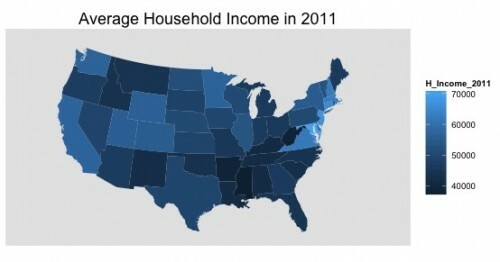 Liberalians earn more than Teapartystanis. Liberalian households earned an average of $55,756 in 2011 compared to $47,189 in Teapartystan. Liberalian households were 18% richer than Teapartystanis. By their lights, Teapartystanis can acknowledge these facts and rationally reject the expansion of Medicaid. That would make sense if they believed that expanding Medicaid would harm their population’s health or make it poorer. In the states, Republican governors are saying no to billions of dollars in Medicaid money (and, in a number of cases where they said “yes,” their even-more conservative legislatures have said “no” on their behalf). That cuts them off from much-needed funds and cuts their poorest constituents off from free heath insurance. Moreover, it means their safety-net hospitals lose money they were relying on to survive — forcing devastating cuts to care. The result is a poorer state, worse-off residents and a health system under terrible financial stress.